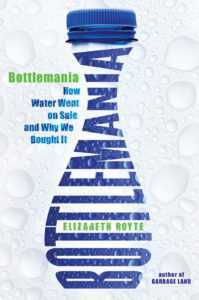 ENTERTAINMENT WEEKLY: Bottlemania is one of 10 “Must Read” non-fiction books of 2008! Time Out Chicago called Bottlemania a Top 10 Book of 2008! In the follow-up to Garbage Land, her influential investigation into our modern trash crisis, Elizabeth Royte ventures to Fryeburg, Maine, to look deep into the source—of Poland Spring water. In this tiny town, and in others like it across the country, she finds the people, machines, economies, and cultural trends that have made bottled water a $60-billion-a-year phenomenon even as it threatens local control of a natural resource and litters the landscape with plastic waste. Moving beyond the environmental consequences of making, filling, transporting and landfilling those billions of bottles, Royte examines the state of tap water today (you may be surprised), and the social impact of water-hungry multinationals sinking ever more pumps into tiny rural towns. Ultimately, Bottlemania makes a case for protecting public water supplies, for improving our water infrastructure and—in a world of increasing drought and pollution—better allocating the precious drinkable water that remains. Read Elizabeth’s story “A Tall, Cool Drink of… Sewage,” in the August 10 New York Times Magazine. Listen to Elizabeth speak about recycled water on WKCR’s Good Food. Listen to Elizabeth on NPR’s Marketplace. Read Elizabeth’s NY Times Op Ed about public water fountains. Listen to Elizabeth on Brian Lehrer’s WNYC radio show. Read her responses to listener questions in this Bottled Water FAQ. Read about Elizabeth Royte, and her books Garbage Land and The Tapir’s Morning Bath, both New York Times Notable Books.